This past Sunday, some ladies from our church hosted a Surprise Baby Shower for us. I was VERY surprised to say the least. It was hosted by our assistant pastors wife...at their house. We were supposed to be going to their house for a church related "meeting". But, there was no meeting!! Anyway, we received lots of great gifts. 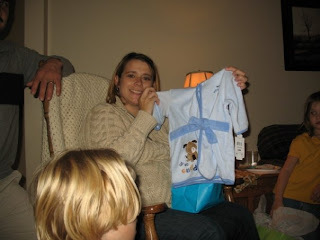 Including the baby bath robe I'm holding in the picture, as well as diapers, wipes, sleepers, thermometer, onesies, towels & washcloths, blankets, hats and toys & cd's. A huge THANK YOU to everyone who attended the shower! You ladies are amazing...not just for the shower & gifts, but for your encouragement & prayers! Hi Jerri! I didn't realize how behind I was on reading your blog until I noticed how many I had missed! How are the curtains and shopping coming? Do we need to have another "girls day" at your house or shopping to help you get ready??? I hope you have a relaxing weekend! Hi Jeri. I know you don't really know me...I'm Morgan Bitikoffer's preschool teacher. Last week during our closing circle time, we were just getting ready to pray, when Morgan began sharing your situation...in a way only a five-year-old can! Her sincere care for you and your family was precious. I just want you to know that we continue to pray for you and your little baby boy each day. I know God has big plans for him, and I look forward to Morgan's updates!